Here’s my Many Crops, Many Plantings slideshow from my shared Friday morning pre-conference intensive workshop at the Carolina Farm Stewardship Conference. High tunnels provide high-value space for growing various crops throughout the year, but maximizing production comes with challenges. In this workshop, Gena and Pam will discuss how to effectively use high tunnels to maximize potential. Topics include monocropping for wholesale production, diversified high tunnel production, and effective management throughout the year. The November/December issue of Growing for Market is out, including my article on Hoophouse Squash and Cucumbers for Crop Rotation. We transplant one bed each of summer squash and bush cucumbers in our hoophouse on April 1st. This gives us harvests a month earlier than the outdoor crops. It also helps us have a crop rotation (compared to tomatoes and peppers in all the beds every year.) We find that people really enjoy early squash and cucumbers, as a welcome change from winter crops, and a harbinger of what is to come. We end the squash and cucumber sin July, once the outdoor plantings are bearing well, and use the hoophouse space for cowpeas or edamame, usually. Summer cover crops would be another fine option. Hoophouse squash between beds of tomatoes in July. A great resource I discovered quite recently is Modern Farmer. There are sections on animals, how-to, politics, videos, environment, lifestyle, recipes, food & drink, plants and technology. You can sign up to receive their weekly newsletter. While at teh CFSA Conference I participated in the High Tunnels Bus Tour, and saw a whole hoophouse planted wall-to-wall with lettuces at 6″ spacing using one of these. For next week, I’ll sort out my photos from that event and also my visit to Potomac Vegetable Farms where Zach Lester is focusing on protected crops using hoophouses and caterpillar tunnels. 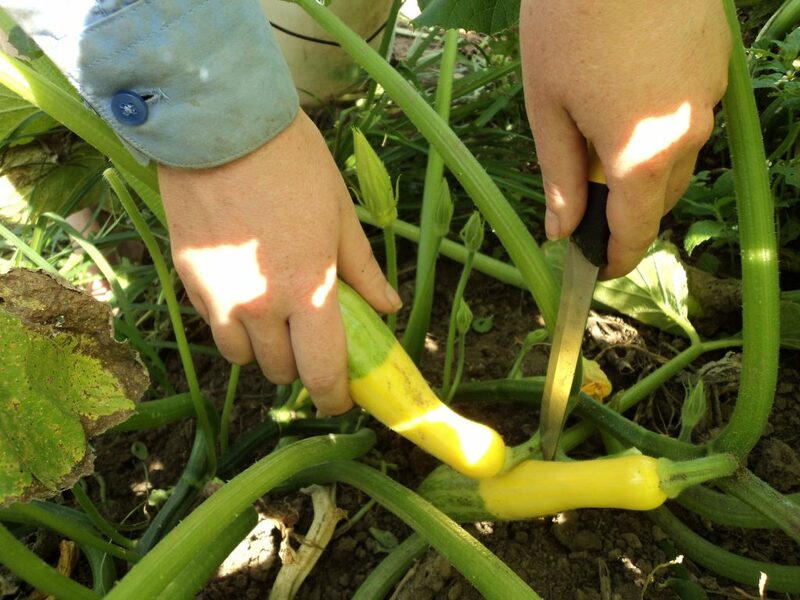 Starting with what’s being harvested now – squash and zucchini are coming in nicely. The hoophouse Gentry yellow squash (chosen for being fast-maturing) is coming in by the bucketload, and the outdoor yellow squash and zucchini have started producing. Cold-hardy Winter Vegetables,on Saturday 6/10 at 11 am on the Yanmar Sustainability Stage, immediately followed by book-signing at the Mother Earth News Bookstore noon- 12.30. 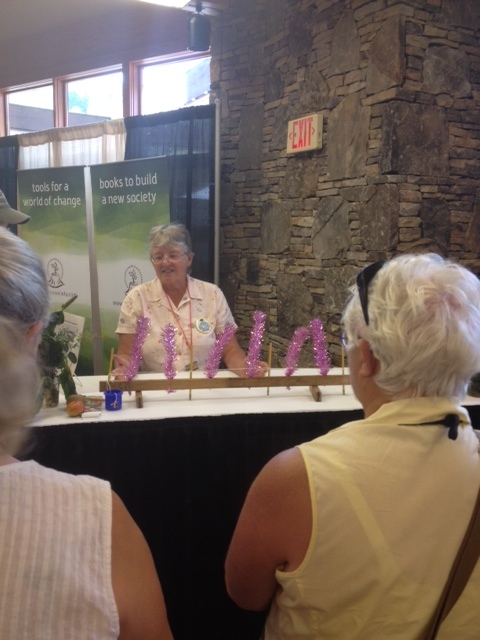 Producing Asian Greens on Sunday 6/11 at 3.30 pm on the Heirloom Gardener Stage. I’m also doing demonstrations of tomato string-weaving at the New Society Publishers booth 2611, near the Mother Earth News Stage (not the Bookstore this time), at 10 – 10.30 am and 3-3.30 pm on Saturday and 10 -10.30 am, 11- 11.30 am and 2- 2.30 pm on Sunday. Check out my Events page to see the pink sparkly tinsel tomato plant models I use! At the Heritage Harvest Festival near Charlottesville, Virginia, on Friday September 8 (the Premium Workshops before the main Festival), I’m presenting on Growing Sweet Potatoes at 3.30-4.30 in classroom 7, followed by book-signing at the Monticello Bookshop. 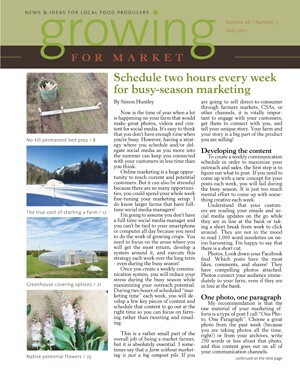 The June/July summer issue of Growing for Market magazine is out, and includes my article on Hoophouse soil salt buildup. This is an issue we have been dealing with – we see white deposits on the soil. I did a lot of research and found ways to water the salts back down deep in the soil profile. I also gathered information on how to measure and monitor salinity, and how to understand the test results and their different testing methods and different units of measure. I learned about salt tolerance of different crops, the plant symptoms of excess salinity, and how to prevent the problem in future. 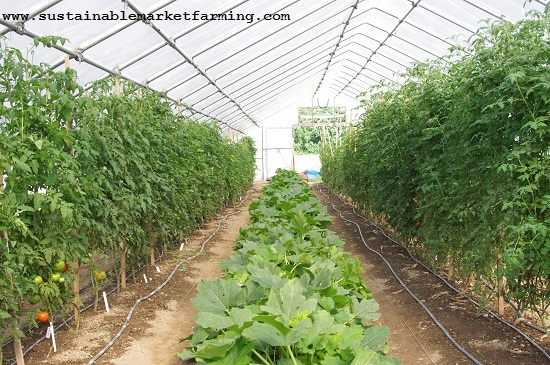 This topic is rising in importance as more people use hoophouses with drip irrigation systems. We were blithely ignorant for our first several years of hoophopuse use, as salinity takes a few years to really develop, and there wasn’t much information available. 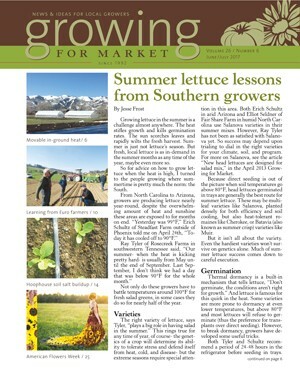 I’m also looking forward to reading the other articles, especially Summer lettuce lessons from Southern growers by Jesse Frost. There are some great photos of beds covered with hoops and shade-cloth, which show a good system. I always appreciate articles written for southern growers, which can be in short supply. Daisy Fair in Utah’s zone 5 has written about moveable tunnels with in-ground hydronic heat. So there’s information for cold climates too. Sam Hitchcock Tilton has an article with tips learned from Dutch and Swiss farmers. Robert Hadad advises on careful monitoring of costs of production in order to actually make a living from farming. The flower growing article in this issue is from Debra Prinzing and is about American Flowers Week, a chance to highlight American-grown flowers with some light-hearted fun photos. The May/June Organic Broadcaster just arrived in its paper format – I’ve had the digital one for a while. Good thing I’ve got that long car ride to Vermont this weekend to catch up on my farming reading! sunflower/milo (grain sorghum)/fallow rotation. They are also trialing some ancient grains. Organic production in the US is not meeting demand, and organic imports are increasing, including organic soy and feed corn, not just bananas and coffee. More farmers want to produce Organic poultry, eggs, milk and meat. And so they are looking for Organic feed at an affordable price. This is often imported, which raises issues about how Organic Standards vary from one country to another, and the bigger issue of sustainability – not always the same as Organic! Does it really make sense to ship in grains to feed livestock? Harriet Behar writes about the true meaning of Organic and overall methods of production. It’s not just about following rules on allowed inputs and materials – it’s a whole approach to how we treat the soil, our plants and livestock. Hannah Philips and Brad Heins share research on how cover crop choices can influence the fatty acids and meat of dairy steers. Jody Padgham writes about CSAs responding to competition and decreasing membership by offering more options on shares and delivery. Gone are the days of “One box, one day, one price” CSAs. Numerous modifications of the basic CSA model have sprung up to better fit the diverse needs of customers (members). Kristen McPhee writes about the Vermont Herb Growers Cooperative, which buys from various small-scale growers and aggregates orders to larger buyers. Other topics covered include lessons learned from Hawaii’s GMO controversy, paying for end-of-life care without losing your farm, and many short items and classified ads. As always, a newspaper packed with information. 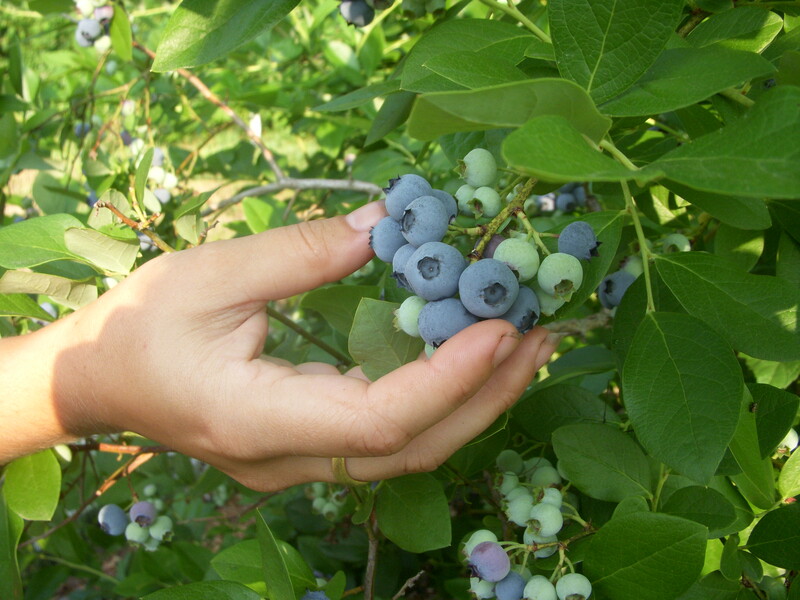 And by the way, we’re also picking blueberries – ah! heaven! I always know when garlic growers in slightly warmer or more southern climates are starting to find scapes (the edible firm flower stems of hardneck garlic) because my posts about scapes suddenly become popular! My posts “Garlic scapes! Three weeks to bulb harvest,” and “Garlic scapes to cheer us up” have been reread a lot recently, and Harvesting garlic is due for attention any time now. My Growing Great Garlic slideshow is here. Click the diagonal arrows to view it full screen. And sure enough, our own scapes are ready too, even though this is a week earlier than usual.We harvest two or three times a week until there are no more. 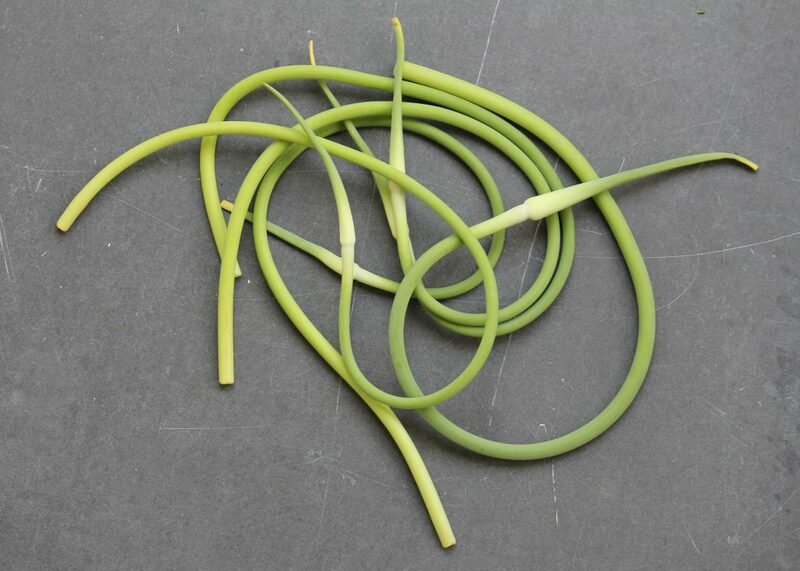 I love garlic scapes as one of the first outdoor crops of the spring, and a flavor different from leafy greens and stored roots, the staples of early spring. Our tulip poplars are flowering now too, also early. Our average date for those is 5/1, and we’re a few days ahead of that. When I was a beekeeper it was important to be ready for the tulip poplar flowers, because that was our big nectar flow of the year, and I had to dash out to the beeyard and stack up 5 supers on each hive. I had to give up on the beekeeping because the combination of lifting heavy boxes and twisting was hurting my back too much. Oh, and those heavy boxes were full of thousands of stinging insects, but I didn’t mind that bit as much. The flowering of tulip poplars and the germination of ragweed are both phenology signs that signify that the Growing Degree Days have reached 200 (on a base of 50F) and that conditions are warm enough to sow sweet corn. Myself, I watch the young leaves on the white oaks and when they are the size of a squirrel’s ear, I decide it’s warm enough for corn. 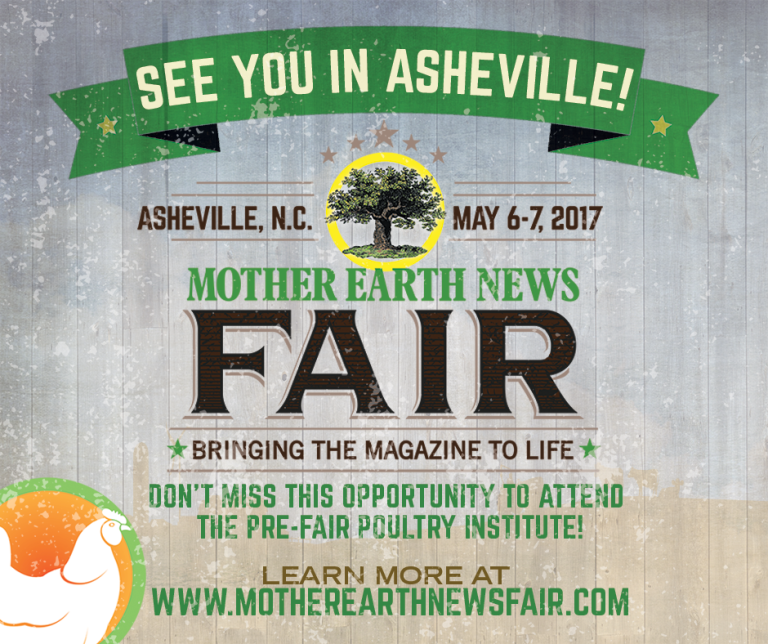 This weekend I will be at the Mother Earth News Fair in Asheville, NC. Click the link to see the location, the workshop schedule and the list of vendors who’ll be there. I’m presenting two workshops, Growing Sweet Potatoes from Start to Finish on Saturday 5/6 at 12.30on the Yanmar Sustainable Agriculture Stage, followed by book-signing and chatting at the Mother Earth News Bookstore; and Succession Planting for Continuous Vegetable Harvests on Sunday 5/7 at the Heirloom Gardener Stage. Of course, you’ll need to be there and hear me speak to get the most out of it. I’m also doing short demonstrations of How to String Weave Tomatoes at booth 2800, New Society Publishers (near the Bookstore) on Saturday at 10 am, 11 am and 5 pm, and on Sunday at 10 am and 11 am. They’re half-hour time slots. My table top demo kit uses #2 pencils and pink tinsel. At the New Society Publishers booth at the Pennsylvania Mother Earth News Fair, demonstrating how to string weave tomatoes. The May issue of Growing for Market magazine is out, including my article about growing seed crops in hoophouses. 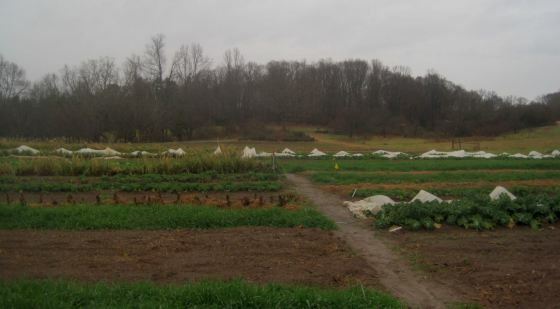 I interviewed Clif Slade, founder of the 43560 Project at Virginia State University, about several creative sequences of food crops and seed crops he has grown in a high tunnel. (Collards, okra) as well as plant starts (sweet potatoes, onions). He farms in Surry County, Virginia. One Paragraph”. His goal is to help farmers stay in the spotlight with their products, without having to spend a great deal of time on it in the busy season. Conor Crickmore has an article about preparing and laying out no-till permanent raised beds very precisely in a hoophouse. He uses the Quick Cut Greens Harvester to mow off over-size baby salad crops to clear the bed prior to broadforking and adding needed soil amendments. I love it when I get the chance to read great books and then tell other people about them. And, of course, books make great gifts. If you want to read more of my book reviews, click on the Book Reviews category in the list on the left side or here. Edited by Lee Buttala and Sharyn Siegel. Written by Michaela Colley and Jared Zystro. Published by John Torgrimson, Seed Savers Exchange, 2015. Distributed by Chelsea Green $29.95 400 pages. Seed Savers Exchange published Suzanne Ashworth’s Seed to Seed in 1991, one of the first popular seed-saving books. The Seed Garden brings the information up to date. 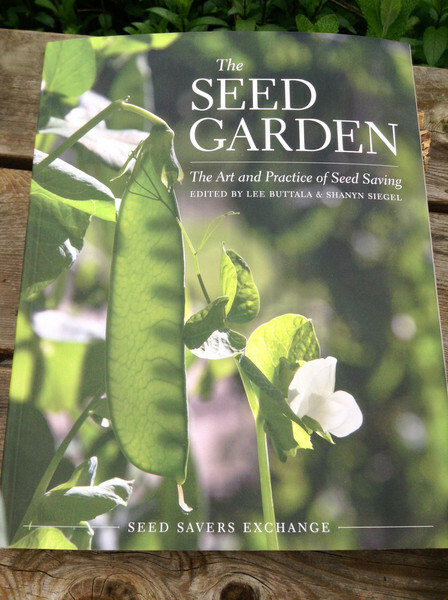 This is a beautiful, inspiring and informative book, which provides all you need to know to start seed growing, or to start saving seeds from a crop new to you. The explanations are clear. The technical information that you need is in a very readable, accessible form. Many mysteries and confusions are cleared up. With this book, you have all you need to understand how to reliably get plentiful viable pure seed. Section 1 covers the botany of seed saving, pollination methods, plant life cycles, maturity indicators, seed harvesting and drying methods, seed-borne diseases, seed longevity and how to store seeds. Section 2 includes information on population size (how many plants you need to preserve genetic diversity), and isolation distances (how much distance is needed between your seed crop and other crops it could cross with). The crop profiles are by scientific name. Appendices explain germination testing and a table of seed-borne diseases. Throughout the book are “Master Class” sections, giving two or three pages of practical advice (such as how to hand pollinate squash) and explanations of important phenomena such as inbreeding depression, photoperiodism and vernalization. There is an excellent glossary and a good index. There are chapters with Regional Considerations. For example the mid-Atlantic has hot summers long enough for most heat-loving crops, such as cowpeas, limas, eggplant, peppers, sweet corn, melons and watermelon. There is regular rainfall and high humidity, which can lead to fungal and bacterial diseases, so it is harder to grow dry-seeded crops. Harvested material should be brought under cover. Biennial seed crops can usually be over-wintered outdoors. Except in the hotter regions of the mid-Atlantic, winter is cool enough for vernalization. Cool season crops are best sown early so that seed is produced before the very hot weather which can reduce seed quality. I read up about growing buckwheat seed, because I participated in a VABF/VSU buckwheat trial which included growing some seed. Buckwheat takes 10 weeks to produce mature seed. Temperatures above 90F reduce seed yield. The minimum population size is 80 plants, and the isolation distance is 800ft-1/2 mile for home use, 1-2 miles for commercial seed. Buckwheat has perfect flowers (that is, all flowers have both male and female parts), which come in two types. The pin types have long styles and short stamens; the thrum type have short styles and long stamens. An individual plant produces only one type of flower and pollination is only possible between different flower types. This is referred to as an “obligate outcrosser”. Another section I studied was the explanation of the difference between Brassica napus and Brassica oleraceae. Brassica napus varieties (rutabagas, Russian and Siberian kales) are biennial and must undergo vernalization in order to flower and set seed. Vernalization requires plants with about 8 leaves standing for 10-12 weeks at temperatures below 40F. They are hardy to 10F. Brassica oleraceae annuals (such as heading broccoli) on the other hand, have only a minimal cold requirement of 1-4 weeks below 50F before they start to flower. The biennial B oleraceae (European kales, Brussels sprouts, cabbage, collards, kohlrabi, sprouting broccoli) need 10-12 weeks below 50F before flowering. They are hardy to 20F or lower (some much lower). Finally I read up on growing sweet potato slips, which I do every spring, hoping to learn a new trick. Presprout at 80-85F and 90% humidity, for 2-3 weeks. (I think I do that) Then plant in 2-3” moist sand at 80-85F for 4-5 weeks until shoots emerge. (Yes, I do that but use compost rather than sand.) Cut the slips 1” above the sand (compost) when they are 8-12” tall. (Yep.) Pot up or plant directly (We plant into flats for a few weeks). I’m on the right track, no worries there. My examples show you the level of detail and breadth of topic that this book includes. Additionally, the photos are breath-taking. A book of practical inspiration! On the Seed Savers Exchange page for the book, you can view a short video about seed-saving. Meredith Leigh has given us a wonderful book. The trifecta of practicality, politics and poetry. “You need food. What everyone will not admit is that you should love it too. If you don’t love good food, put this book down. 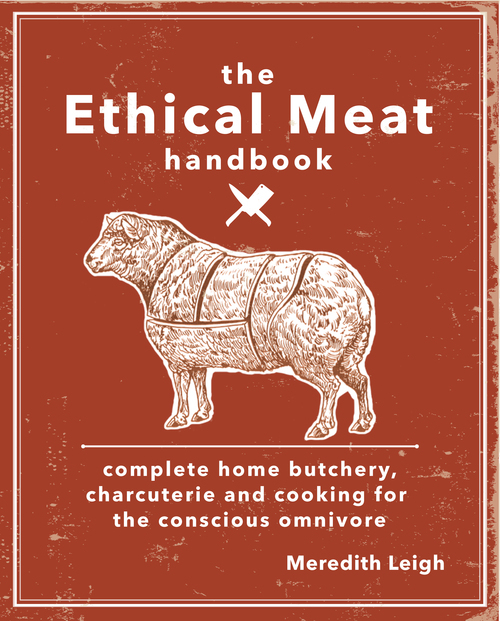 Now.” “The key is to honor the process, the pursuit of good food.” Ethical meat is that from an animal which enjoyed a good life, was afforded a good death, the meat is butchered properly, then cooked or preserved properly. One aspect of her book combines practical information on how to butcher beef, lamb, pork and chicken step by step; make sausage and smoked meats; raise livestock humanely and successfully make a living doing so. She encourages and demystifies, sharing otherwise hard-to-find information in words and photos. I won’t say much about this section. I have butchered poultry and in the past, a few sheep. But this is not my area of expertise. The second aspect includes the politics of animal farming. Meredith says “I am not a meat-crazed woman. I detest dietary dogma.” She was vegetarian for nine years, vegan for two, and also a vegetable farmer. She advocates for integrating meat consumption into a robust, diverse diet. She explains that she became a vegan motivated by “deep empathy and political aggravation . . . but my solution, sadly, mostly helped only me.” She now sees that her diet had been one of luxury and a desire to escape a system that she felt she could not affect. Now, in her life as a butcher, she can be more politically effective. Her book does not dwell on abuses of livestock, but promotes the more ethical path. In answer to those who criticize the water use of livestock farming, Meredith points out the bigger picture: water given to livestock doesn’t disappear – that which isn’t converted to meat returns to the pastures to improve the organic matter and to be used again. It’s the water cycle we should consider, not water “use”. Using water isn’t wrong – it’s important how you use it. Supermarket food is subsidized by our tax dollars. We are not paying the true cost at the point of sale. The true cost of “cheap” food includes higher healthcare costs, higher environmental clean-up costs. Paying in installments causes us to expect food to be cheap. The third aspect of her book is her poetic way of sharing her observations and feelings. Her farming and domestic partnership collapsed, she lost her farm – clearly that was hard. And while it’s clear that losing her farm was hard, it’s just as clear that Meredith has jumped back on her feet, and now she runs a retail butcher shop. “Inspire yourself to a point of spirituality towards the animals you raise.” She is a true foodie: “Good food ignites all of our senses.” She generously shares some very delicious recipes. Resilient Agriculture: Cultivating Food Systems for a Changing Climate. Since April I have been reading the book and finding lots of practical tips as well as moral support and help with thinking clearly about what could otherwise be a paralyzing topic: producing food in the face of an increasingly erratic and unpredictable climate. This major transformation is so hard to consider that at times I’ve thought “thank goodness I’m already in my sixties – it’s the younger people who will have to bear the brunt of coping with this mess.” I know that is neither a constructive nor a realistic approach – we each need to make our best effort if our species is to survive the wild changes and unprecedented obstacles ahead. Temperatures and rainfall outside of our experience are some of the challenges. There are also effects we have barely begun to think about: different bugs and plant diseases; weeds which can grow faster than before; times of desperate water shortage, times of flooding; hurricanes and other strong winds; colder winter and spring temperatures affecting bud burst of fruit and nut trees. But this is far from a doom-and-gloom book. Nor is it a “Blame Industry/Government” tome. It is a very practical and constructive aid to successful sustainable farming. In some cases we have already been practicing some of the skills we’ll need: growing a diversity of crops and livestock; learning from our experience (record-keeping! ), paying attention to the weather and learning to forecast our local weather; making plans we are prepared to change as conditions change, and having enough workers, seeds and machines to take advantage of smaller windows. Young blueberry bush in the snow. In the Southeast, farmers report more frequent summer droughts, more and hotter heat waves, increased intensity of hurricanes, and in general more frequent extreme weather events of all types, more often. This is what we need to be ready for, at the same time as we reduce our own carbon footprints and campaign for national changes. Starting around 1980, the length of the frost-free season increased across the US. In the SE, it became 6 days longer. Ours is the region with the smallest change. On the other hand, the Southeast has seen a 27% increase in the amount of rain and snow dropping down as very heavy precipitation. The East has become a bit warmer and has heavier rainfall/snowfall, while the West has become hotter and has a smaller percentage change in the amount of heavy precipitation. In Resilient Agriculture, Laura Lengnick uses her own extensive knowledge of the science and politics of climate change and her personal experience of growing food, along with her interviews with award-winning sustainable farmers across the US to give us a both a basic framework for approaching the issue and many practical tips. Climate change is yet another production risk to assess and prepare for – a big one. The vulnerability of a farm is the degree to which it is susceptible to adverse effects of climate change. It is a combination of exposure, sensitivity and adaptive capacity. Thinking about climate change using this framework helps us focus on the components we have most control over: sensitivity and adaptive capacity. Exposure and sensitivity acting together decide the potential impact of climate change. Water issues (too much and too little) are the most immediate key exposures (changes in conditions). Rising air temperatures, including night temperatures, more extreme temperatures provide threats and some opportunities. Increasing CO2 levels will provide some positive effects such as faster crop growth. We can reduce exposure overall by reducing emissions and increasing carbon sequestration. These broad efforts are vital, but will have less immediate effects at a farm level. Sensitivity is a measure of how much a given farm is affected by the conditions (exposures). For example, is the farm in a flood plain in a region that can expect more floods in future? What are the factors limiting the ability of the farm to adapt to climate change? Assessing the farm’s sensitivities provides a good starting point for planning adaptive strategies. Adaptation is the method most successful in addressing the challenges of climate change at a local level. Adaptive capacity includes our individual capability, knowledge and options, and the operating context (your farm’s unique combination of economic, social and ecological conditions). As far as adaptive capacity, the main feature of that aspect is our personal capacity to respond and plan. Laura Lengnick says “Greater attention to climate as critical for decision-making is expected by future generations of producers.” We need to start with ourselves. The interviews encompass farmers of vegetables, fruits, nuts, grains and livestock. Each production section includes five to ten farms in various parts of the country and ends with a summary of challenges to the adaptive capacity of farmers in that production area. Farmers report on changes they have observed in the past twenty years, whether those changes seem to be long term, and changes they have made to their farming practices as a way to improve their chance of harvesting good yields. Naturally I paid most attention to vegetable growing, and to farmers in the Southeast, to get some ideas on what changes I might wisely introduce. I also found the sections on other types of farming useful, noting that fruit and nut tree growers were looking at diversifying into annual vegetables because of problems with late frosts or insufficient chilling hours that can lead to a complete crop failure in a perennial. Grain farmers had very interesting advice about mixtures of cover crop seed, cocktails of 10 – 20 different cover crops, to increase the chance of improving the soil and gaining longer-term benefits of resilience. 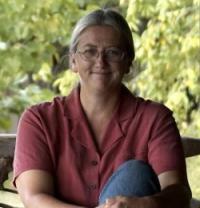 Laura Lengnick is one of the main authors of a USDA ARS report Climate Change and Agriculture: Effects and Adaptation. (USDA Technical Bulletin 1935) Feb 2013. She also participates in the Climate Listening Project, a “storytelling platform for conversations on climate change resilience”. You can learn more about the Climate Listening Project in their introductory video. 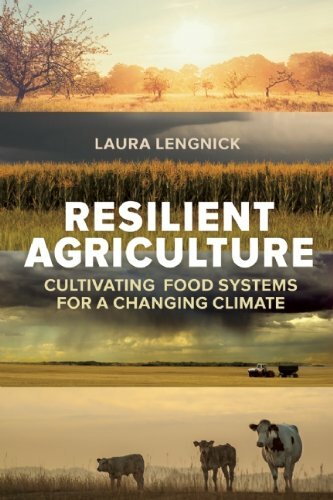 Here’s a new book I’m really looking forward to reading: Laura Lengnick’s Resilient Agriculture: Cultivating Food Systems for a Changing Climate. $19.95 from New Society Publishers. Like many farmers, I’ve been struggling not to get despondent about erratic and extreme weather, especially in the past few years. I worry about how and if we are going to be able to adapt to continue producing good food despite extreme heat, cold, drought and deluge. I don’t want to slide into catastrophic thinking about plagues of new pests and diseases. Obviously we’ll need to make changes to how and when we plant and harvest – old-timey calendars don’t work any more. I’m already there with the need for good record-keeping (to figure out what works best); eating and supplying local food (to reduce transportation fuel use and to get the freshest food); and doing my personal best not to make climate change worse. And I need help in understanding how to be more resilient and use the options I have. And it’s definitely time to start this! 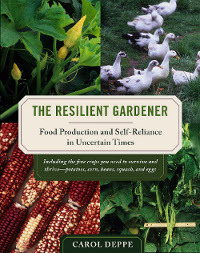 Resilience is a concept familiar to another author, Carol Deppe, whose new book The Tao of Vegetable Gardening will, sooner or later, get a review by me on this site. I enjoyed her earlier book, The Resilient Gardener: Food Production and Self-Reliance in Uncertain Times. That book focuses on staple crops for survival: potatoes, corn, dry beans, squash and eggs. Her new book includes other crops which make our lives richer and worth gardening for: tomatoes, peas, green beans, summer squash. I just read an interesting interview with Carol Deppe from Margaret Roach who blogs as A Way to Garden, and makes radio podcasts such as this interview. And yet more reading! 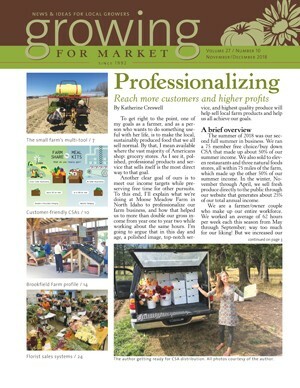 The April issue of Growing for Market is out. I’ve written the first of a pair of articles on hot weather greens. This one is about greens mostly cooked and eaten. next month my article will be about greens mostly eaten as salads. I know there is a lot of overlap, but I had to draw a line somewhere! This month’s article includes chard, Malabar spinach, New Zealand spinach, beet greens, Egyptian spinach, leaf amaranths, Aztec Spinach, Water Spinach, sweet potato leaves, squash leaves and shoots, crowder pea shoots and leaves and edible celosia. No need to go short of leafy greens, no matter how hot it gets! Another article in this issue is about pesticide drift contamination, written by Joanna and Eric Reuter, whose fascinating blog I love to follow on their website Chert Hollow Farm. Their blog has a 3-part series of posts about their own experience of being contaminated by a neighbor. Their article tells their own story more briefly and also that of Terra Bella farm, an hour from them. 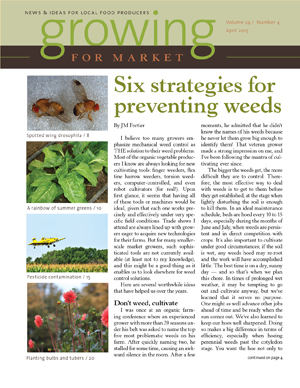 Jean-Martin Fortier has a great article on Six strategies to prevent weeds. We need them all! (Of course, we are already using some of them.) Raymond Cloyd from Kansas State University has written a timely article about the Spotted Wing Drosophila, a newly emerging pest of fruit, especially brambles. Gretel Adams, in her regular column on flower-growing, advises planting bulbs quickly and often. And Lynn Byczynski reports on what the ag census says about local food. Having the report read carefully and summarized for us is a great service. 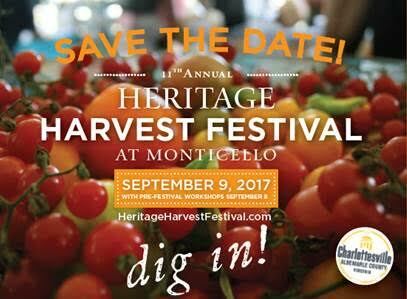 I’m gearing up for my Cold-hardy Winter Vegetables presentation on Friday September 12 at 9 am at Monticello (near Charlottesville, VA) as one of the Premium Workshops of the Heritage Harvest Festival. After my presentation I will be signing copies of my book Sustainable Market Farming (see the tab About Pam’s Book) at 10.15 am at the Monticello bookstore. Come by for a chat, even if you’re not buying a book that day. 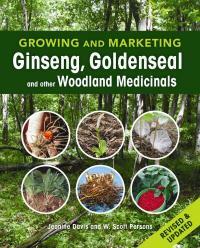 Jeanine Davis, author of Growing and Marketing Ginseng, Goldenseal, and Other Woodland Medicinals will be signing copies of her book at the same time. Last time I looked there were still some tickets available for each of the premium workshops except Peter Hatch’s tour of the vegetable garden. The Heritage Harvest Festival is a lovely event, promoting and celebrating gardening, sustainability, local food, crafts and the preservation of heritage plant varieties. This is the 8th Annual HHF, hosted by the Thomas Jefferson Foundation in partnership with Southern Exposure Seed Exchange. There are food booths, music, a beer garden, events for children (last year they were splitting fence-posts and making split rail fences). There is also a seed swap, so bring what you have to offer and take home something different. This year there is also a Special Thursday event on Edible Landscaping with Rosalind Creasy and our own Ira Wallace. 1-4 pm, $45. On Friday there is also a special Harvest to Hearth event where you can watch a demonstration of cooking on a fire in the Monticello kitchen. 9-11 am, $55. If you are making a special occasion of the weekend there is the Chefs’ Harvest Dinner 6:30 – 9 p.m Friday. It’s $125 and it’s bound to be good. Outside my price range, by quite a bit. If you can only come for one day, come for the main event on Saturday, with booths where you can watch crafters, buy seeds, plants, tools; taste more varieties of tomatoes than you knew existed; attend various free workshops and tours of the Monticello vegetable garden and woodland walks. Adult general admission for Saturday is $10 until September 11, $15 At the Gate. Child tickets and family tickets are also available. It’s a fun day at a fair price. Lots to see and do, and a beautiful setting. Ken Bezilla of Southern Exposure Seed Exchange is offering his workshop Fall & Winter Veggies: Zero Degree Gardening for free at noon on Saturday at the Vegetable Gardening Tent. So if all the $10 tickets for my workshops are sold out, or you can’t make it on Friday, go to his workshop on Saturday! Or just to hear a second opinion! On Friday, after my book signing and hers, I’m zooming off with Cindy Conner of Grow a Sustainable Diet fame, up to Pennsylvania for the Mother Earth News Fair at Seven Springs. No, it wasn’t our idea to have both events on the same weekend, but we’ll make it work! A weekend pass is only $25 (and you’ll need to find accommodation). It’s only $15 if you hurry up and pre-order! Food is available at the Fair, but bring something in case the lines are long. The Fair website has links to hotels and campsites, and there are some rooms at the Seven Springs resort itself. It’s a huge event, with row upon row of vendor and exhibit booths, and 12 workshop locations offering a series of 4 workshops on Friday afternoon, 6 on Saturday and 5 on Sunday. That’s 180 workshops for grown-ups. And there’s a kids’ program too. I’m also doing a book signing on Saturday 2-2.30 pm at the MEN bookstore. Meanwhile we are getting a sudden spell of hot weather and have started catching up on tilling raised beds for fall crops, and in some cases, oats as a winter cover crop. We have decided to stop harvesting watermelons for eating at 531. I wrote about our decisions about how many watermelon to plant and to harvest in 2012. We’ve had a banner year! We had the biggest melons ever – some were hard to lift! And the flavor has been delicious! And the foliage is still in good shape, not diseased. A big success. We harvested about 40 so far for seed, and will do one big bulk seed harvest round on Wednesday. 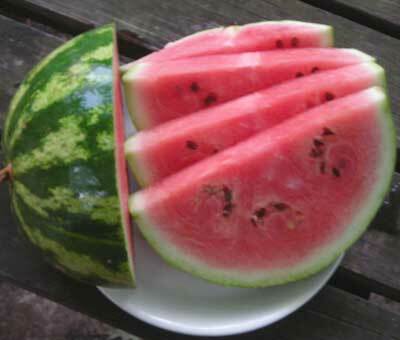 Next year you can grow our Virginia Select Crimson Sweet watermelon! Buy the seed from Southern Exposure. Crimson Sweet Virginia Select watermelon. Before I dive into my review of this wonderful book, newly published in English, I just want to direct people to my posting on Mother Earth News Organic Gardening blog about the trapped skunk which I told about two weeks ago. While there, check out the other posts. Jean-Martin Fortier’s The Market Gardener: A Successful Grower’s Handbook for Small-Scale Organic Farming, has recently been published in English by New Society Publishers. It has been available in French since 2012, and has sold over 15,000 copies. Jean-Martin and his wife Maude-Hélène Desroches run an impressively productive, tiny bio-intensive vegetable farm in Southern Quebec, Canada. They use low-tech and manual farming methods (no tractors), and have found some unusual and successful high-yielding techniques. They grow on just 1.5 acres, arranged as 10 plots each of 16 raised beds 30” x 100’ long. The paths are 18” wide. The garden plots surround the building, which was a rabbit barn before the farmers converted half of it into their house and half into a packing and storage shed. Their planning is a wonder of considered efficiency and function. I hear it’s also beautiful. This book will be an inspiration to all those hoping to start in small-scale vegetable farming but lacking land and money. If you can gather the money to buy a small amount of land (or find some to rent), this book will provide you some of the expertise to make your very small vegetable farm successful, without tractors or employees. Neither Jean-Martin nor I would claim it will be easy, but this book shows that it is possible, given hard work and smart work. So don’t believe those who say it can’t be done. The tips from this book will ease your way, once you have served an apprenticeship on another farm. Their small farm is called Les Jardins de la Grelinette, which translates as Broadfork Gardens, giving you a clue to one of the tools they value. In many ways, Jean-Martin is in the school of Eliot Coleman, producing top-notch vegetables and books from a small piece of land with only a small workforce. Even the drawings remind me of those in Eliot’s books. Biologically intensive production can feed the world, as well as provide a decent living for farmers. Attention to detail is required, as there is little slack for things to go very wrong. They run a 120 share CSA for a 21 week season and sell at two farmers’ markets for 20 weeks. They grow a ponderous quantity of mesclun (salad mix)! They even sell it wholesale. Jean-Martin and Maude-Hélène studied the value of all the crops they grew, comparing sales with labor and other costs, including the amount of land used and the length of time that crop occupied the space. They provide a table of their results, assigning profitability as high, medium or low. A quick glance shows you why 35 beds of their 160 bed total grow mesclun – number 2 in sales rank, despite being only number 19 in revenue/bed. This is because salad mix only takes 45 days in the bed, and then another crop is grown. This book deftly illustrates the importance of farming to meet your goals and to fit your resources. My climate is very different from Quebec. I’m providing 100 people for a 52 week season. We don’t want 300 pounds of salad mix each week! We do want white potatoes, sweet potatoes, carrots and winter squash to feed us all winter. And yet I find more similarities than differences. We both want high-yielding, efficient farms that take care of the planet, the soil and the workers as well as the diners. We value quality, freshness and flavor. We do season-extension to get early crops in spring. When novelty is important, we grow several varieties of a crop. The start-up costs at La Grelinette ($39,000) include a 25’ x 100’ greenhouse, two 15’ x 100’ hoophouses, a walk-behind rototiller and several big accessories, a cold room, irrigation system, furnace (remember they are in Quebec! ), a flame weeder, various carts, barrows and hand tools, electric fencing, row cover, insect netting and tarps. Jean-Martin sets out all the costs, all the revenue from each crop – valuable solid information for newbies or improvers alike. I came away from this book with several ideas to consider further. Jean-Martin recommends a rotary harrow rather than a rototiller. It has vertical axes and horizontally spinning tines, and stirs the top layers of soil without inversion, being kinder to the soil structure. It comes with a following steel mesh roller, which helps create a good seed-bed. Earth Tools BCS in Kentucky sell Rinaldi power harrows that fit the bigger BCS walk-behind tractors. 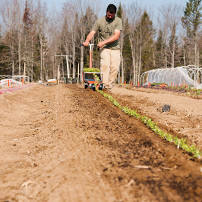 The Berta plow is another BCS accessory that Jean-Martin favors, in his case for moving soil from the paths up onto the raised beds. I think we could really use one of those too. Broadforks and wheel-hoes are already in our tool collection, but the use of opaque impermeable tarps to cover garden beds short-term between one vegetable crop and the next is really new to me. These tarps are sold as silage/bunker/pit covers, and are 6mm black, UV-inhibited polyethylene. Weeds germinate under the plastic, where it is warm and moist, and then they die for lack of light. Earthworms are happy. The tarps can be cut to the width of one bed, and rolled after their 2-4 weeks of use. 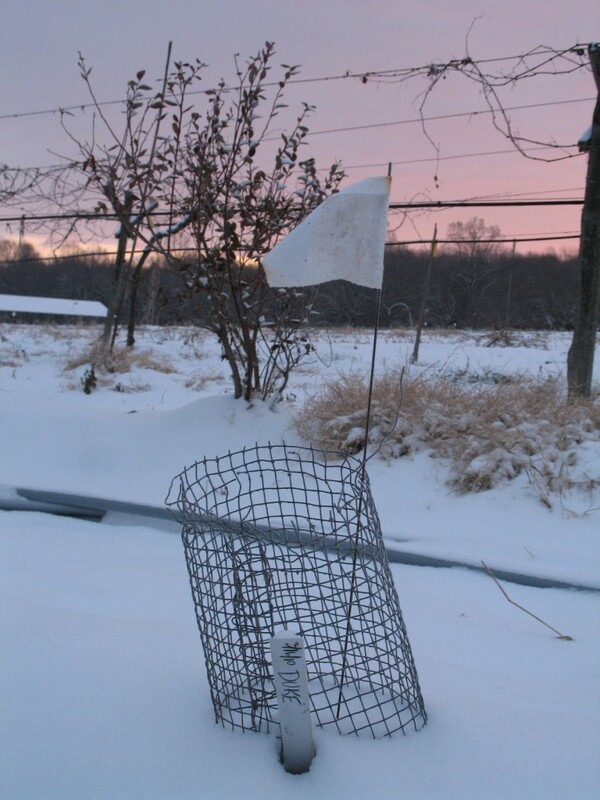 This could be a useful alternative when there is not enough time to grow a round of buckwheat cover crop (or it is too cold for buckwheat, or your tiller is in the shop). Weed pressure on following crops is also reduced. Tarps can be used to incorporate a flail-mowed cover crop as an alternative to using a tiller. At Twin Oaks, our gardens are in many ways like a CSA with one big box for the whole community, but in other ways we are more like a self-sufficient homestead – we try to keep our bought-in inputs to a minimum, so producing our own compost and growing cover crops for increasing soil nutrients are valuable to us. They do not fit so well for a micro-farm in the cash economy. For La Grelinette, it is better to buy in compost and poultry manure and keep using all the land to grow more vegetables. The book includes tables of which crops go where, when to plant in the greenhouse and outdoors, pest control options, and lists of what to grow. The appendices include brief bios of 25 crops, and a short list of the crops they don’t grow and why (potatoes, sweet corn, winter squash, celery and asparagus). Jean-Martin is obviously very particular about running their farm as efficiently as possible, but don’t make the mistake of thinking he must be a grim workaholic! He is very funny with his iconoclastic sidebars. “Crop rotation is an excellent practice . . . to ignore.” (He is addressing new farmers who will likely find plans need to change to improve productivity. He doesn’t want slavish dedication to a crop rotation to prevent someone seizing on a better idea.) His paragraph on the hazards of inexperienced workers with insufficient training and oversight was so good I read it out to my crew. We have never had leeks sliced off at the surface or pea plants pulled up as harvest methods, but we have had carrot seedlings pruned to a uniform height of an inch, rather than thinned to a one inch spacing! If you get a chance to hear Jean-Martin speak, don’t pass it up. He is fully fluent in English as well as French, and does a hilarious skit of French people living in Quebec who found it hard to buy good leeks (until they discovered La Grelinette). His spoof of French-accented English has to be heard! This book is a delight and an inspiration, well worth the cover price. 224 pages, black and white drawings, 8.5” x 8.5”, $24.95. ISBN 978-0-86571-765-7, New Society Publishers. I spent the weekend of January 31/February 1 at the Virginia Biological Farming Conference in Richmond. You can read about it on their website. You can also access at least 16 of the presentations made at the conference, and you can find out about the Farm Tours program for 2014 on their website. Luckily I was not making a presentation this year – luckily, because I was sick, and would have found it difficult. I did three sessions of book signing, and attended some workshops myself. I also met up with a lot of old friends. This past weekend, February 6-9, I was at the PASA Conference in State College, PA. This was my first time at this large 2000 person conference. I presented two workshops, Cold-hardy Winter Vegetables (attended by 135 people) and Producing Asian Greens (attended by about 60 people). Both went well, and generated interesting questions. You can view my presentations on SlideShare.net. Also Rhino Technologies recorded the workshops and will have CDs and MP3s for sale soon. Watch the PAS site for info. I also did some book-signing, and attended some workshops by other farmers and researchers. I was particularly inspired by the PASAbilities Address by Miguel Altieri on Why is agroecology the solution to hunger and food security? You can experience it on YouTube here. A very well researched, outspoken and inspiring person, with a global perspective. Next Saturday (2/15) I will be at Lynchburg College, Virginia teaching an all-day program with Cindy Conner and Ira Wallace. I’m speaking on Feeding the Soil. We would have done more publicity, but the event is sold out! Next week I’ll get my slideshow up on SlideShare.net. 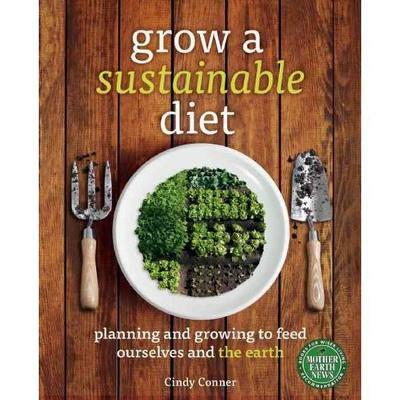 Cindy Conner: Grow a Sustainable Diet: Planning and Growing to Feed Ourselves and the Earth. New Society Publishers 2014. “This book will help you learn how to calculate how much food you need and how much space you need to grow it, ” proclaims Cindy Conner. It is written for the backyarder or homesteader who takes food self-sufficiency and ecology seriously. To grow food crops without depleting the soil or bringing in outside inputs, for instance, you will need to dedicate 60% of your land to growing compost crops or cover crops. This challenge is not for the faint-hearted. But here you have the leader-in-a-book, you are not going it alone. Cindy explains what she means by a sustainable diet and includes a fascinating exercise “What if the Trucks Stopped Coming?” – where would you go to get all your food within 100 miles from home? Within 50? 25? What foods would you be eating and what would disappear from your life? Would the existing farmers be able to supply everyone’s needs locally, or would you need to provide more for yourself and your household? What would your priorities need to be? Your first thought might be that you’d need to make secret stashes of food, and get guns to keep away your hungry neighbors. Cindy says she doesn’t believe guns will keep hungry people away and the better answer is to act from compassion, and work with your neighbors to meet whatever the future brings. None of us can survive without community, so let’s make sure our community is strong enough to meet the challenges. In the Garden Maps chapter, Cindy explains how to divide the available garden space up into smaller plots or sets of beds, increasing your ease of access without losing a high percentage of potential growing space to paths. Beds curved along the contours will reduce rainwater runoff and erosion. On the other hand, straight lines are easier to hoe quickly. Design your garden to suit the ways you use the space – how you get to the chicken pen, or the compost pile. 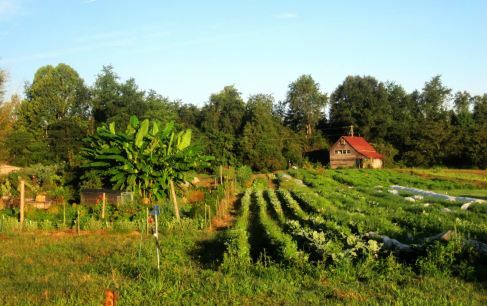 Permaculture design principles have influenced Cindy’s choices. Next you can chose your crops. If all your nutrients are to come from your garden, you will need to pay attention to growing enough calories. otherwise you’ll lack the energy to get to the end of the season! Cindy reports that potatoes, Jerusalem artichokes, sweet potatoes, parsnips, salsify, leeks and garlic are on the list of calories/area. Personally I can’t imagine getting a lot of calories from garlic. Besides the overwhelming flavor there is the issue of the work involved – garlic is labor intensive at certain times of year. Leeks similarly don’t seem a good source of calories per pound, even if they are good per square foot. And winter squash are easy to grow and surely full of calories. They do take space to grow, but I wouldn’t rule them out for that reason alone. If you grow a lot of the calorie crops already mentioned, you will also be growing a lot of protein. Legumes produce more protein, at the cost of needing more space than the high calorie crops above. Beans, peanuts, peas can be interplanted with other crops to get that protein in the most space-saving way possible. Grains provide amino acids that are complementary to those in legumes, and the straw of grain crops is valuable for mulch or compost-making. Calcium is vital for bone health and there is plenty to be found in leafy cooking greens. A little oil or butter on the greens will help assimilate vitamin D, which is as important as calcium. The question of How Much to Grow is important, if time, effort and land are not to be wasted. Locally-adapted varieties and your personal culinary preferences, as well as potential yields per area will influence your planning. 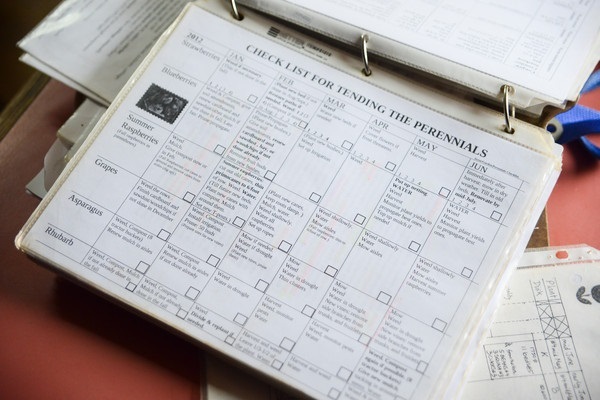 After your first year, your record-keeping will be your guide to making improvements. To keep your garden productive year after year, you will need to feed the soil. You can do this by bringing in organic materials as mulch or to contribute to your compost. If you worry about the reliability of the supply from outside, or whether it is contaminated with herbicides or car exhaust, or whether its production is truly sustainable, you’ll want to be as self-relaint in that department as in the rest of your enterprise. You could grow mulch crops (straw or hay) as part of a bigger farm, in rotation with grazing animals. Or you could grow all your compost and mulch crops within the boundaries of your garden. Compost is a priceless soil amendment, adding not just organic matter and the basic nutrients but also a fine collection of microbes. There are almost as many ways of making compost as there are compost-makers. Cindy prefers the cool, slow method (using a relatively high proportion of carbon materials to nitrogen materials), in order to “farm” the particular mix of microbes that result that way. The annual pile is part of her garden rotation, built on top of one of the beds, starting in the fall. The next fall, after that compost is spread on the garden, winter rye is sown.Next spring this is cut and left as mulch. The rye has scavanged any compost left from the pile and returns the nutrients to the soil as it decomposes around the corn seed (sown into the mulch). Earlier, I said you need to plant 60% of your garden in compost crops or mulch, to have a sustainable system. Two thirds of that space would be in carbon crops and one third in nitrogen crops. Happily, some of the compost materials will be grown as a by-product of a food crop (corn stalks are a good example). The book leads you through the process of identifying suitable crops, and best of all, provides a worksheet to help you determine Bed Crop Months. For each bed, from your plan you determine how many months that bed has food crops and how many months compost crops (remember that one crop can be both!) Winter cover crops really help achieve the goal! After considering each bed, you tally up and see if you need to find more niches for compost crops. All the work in Cindy’s garden is done by hand, including cutting down cover crops, and this is carefully explained. The space is used very intensively, often planting several crops in the same bed to get best use of the space, and so that one can take over from another later. Scheduling so your crops mature when you want them is the next big task, followed by planning a good crop rotation,and fitting everything into the space you’ve got. “Lay out your intentions, stay flexible and keep learning.” More worksheets are provided to help you. Sections on looking after your seeds, on including animals, on food storage and preservation and on sheds, fences and other support systems follow. About animals: “You can plan a diet of only plants, but you would be hard pressed to fill all your nutritional needs without taking supplements, which are not part of a sustainable diet.” Hear, hear!